This screening will now be taking place at Sheffield Independent Film, 5 Brown Steet, Sheffield, S1 2BS. SIF is across the road from Spearmint Rhino and between The Showroom and Persistent Works, a five-minute walk from the bus and railway stations. The attacks on New York and Washington on 11th September 2001 have been described as a “New Pearl Harbor” and they have been used to justify the war against Afghanistan and Iraq, the erosion of civil liberties in the US and the UK and the permanent “War on Terror”. Since 9/11 conspiracy theories have flourished, however one of the least credible conspiracy theory is the official narrative — this selection of films explores some of the 9/11 smoking guns and the possible motivation of those responsible. 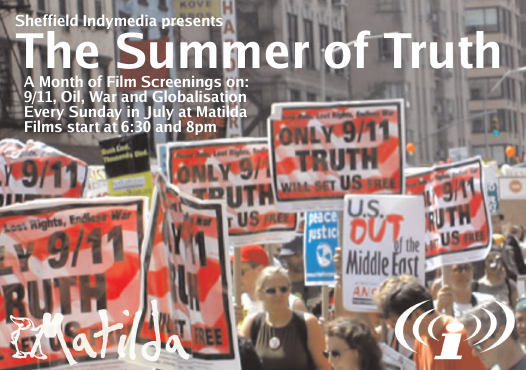 These screenings have been inspired by the summer of truth events in New York, the photo of the anti-war demonstration on the flyer took place in NYC 20th March 2004. 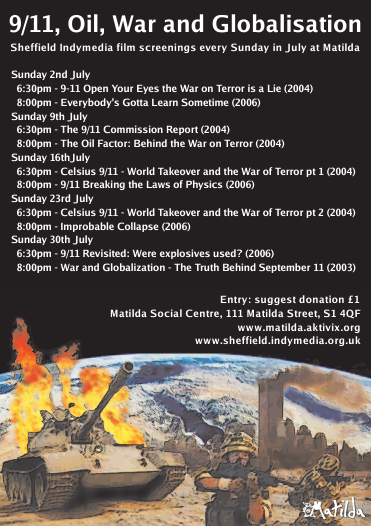 The film details are also available on the Sheffield Indymedia web site. This document was last modified by Chris C on 2006-07-01 09:37:28.